A year after the design was first launched, Zenith Boats' 5.9m Aggressor is set to become the company's most popular model. A finely-proportioned hull with aggressive lines (what else? 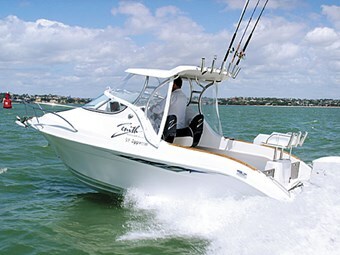 ), its reputation for agile, edge-of-your-seat performance is superseded only by its role as a fishing platform. The notion that the Aggressor could become a strong performer for Whangarei-based Zenith was quickly underscored when it was judged a winner at last year's Hutchwilco Boat Show: it took the award for the best "All Purpose Under 6m" boat. Since then around 12 boats have been sold, and the model is justifiably considered the flagship of Zenith's range of fiberglass trailer boats. The design comes from the drawing board of Mark Workman himself (Zenith Boats' owner and manager), and while more recent Aggressors have enjoyed minor adjustments to suit buyer preferences, Workman scored a perfect 10 with the basic hull. The hull's best observed at speed, with the fine-entry bow cleaving through waves, and the spray being deflected by the prominent strakes. Hull and deck have a pleasing "balance" – and the 150hp Evinrude ETEC on the back looks "just right". The ETEC delivers a nimble package – heaps of torque, rapid holeshot, tight turns – yet it's a reassuringly stable boat at speed. Zenith sales manager Brent Wilson says one Aggressor has been fitted with a 200hp ETEC (it clocked 58 knots), but I can't imagine why you'd want anything larger than the 150hp. Aggressors are built using a blend of hand-laid and chopped gun strand, and the production environment's humidity and temperature are monitored/managed for optimum curing. Hull and deck are taped and glued, with the join covered by a rubber capping rail. The boats are also fitted with a liner (makes for neat, clean cockpit lockers) and watertight compartments in the structure provide a positive buoyancy hull. It won't sink if swamped. Zenith boats come with a five-year structural hull warranty and two-year workmanship guarantee – the result, says Workman, of the company's rigorous quality assurance programme. It's a comprehensive 75-step checklist, which sees every component used in production recorded and tracked with identification numbers. Construction quality doesn't compromise style or aesthetics. The curvy, stainless steel structure supporting the hard-top is particularly attractive (made by Whangarei's Marine and Dairy Ltd), and I liked the use of teak strips on the gunwales and around the dash's parcel tray. Very elegant. With its fixed hard-top separated from the large, polycarbonate windscreen, the Aggressor opts for a compromise. On less than perfect days, the cockpit area can be enclosed with clears (not ideal for foul weather boating, but acceptable). On warm summer days, though, you'll enjoy the wind in your face. The hard-top, incidentally, is soon to be offered with a smart variation: a hinge on the rear supporting struts, allowing owners to pivot the hard-top back into the cockpit. This is particularly useful for those wanting to park the boat and trailer in a garage. The existing, fixed hard-top has an on-trailer height of 3.4m – with the folding version, that drops to 2.6m. 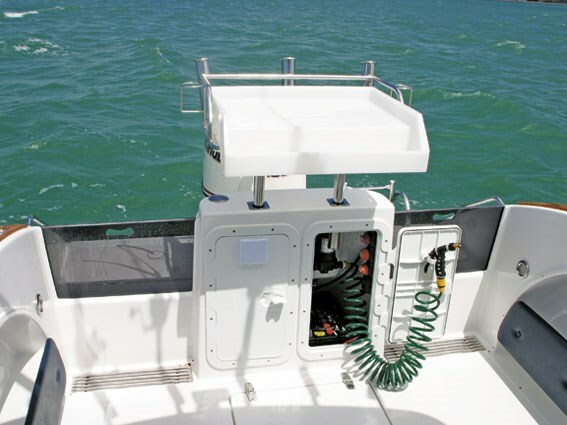 While the Aggressor's features equip it for ultimate boating versatility (it's an easy, all-purpose boat – quickly adapted to towing water toys, diving or cruising at sunset), Workman's fishing bias is obvious. A true "load-the-tackle-and-bait-and-go" boat. For a start, it's a fairly generous, uncluttered cockpit, with full head-room under the hard-top. Access onto the boarding platform is via twin step-throughs – one on either side of the transom's centre station with its large, removable bait tray (manufactured from a hard-wearing nylon). There are two large lockers in the boarding platform, one of which (port) is a venturi-fed, live-bait tank. More lockers are located in the non-skid cockpit floor. It's a free-flowing, easy-to-clean area, and to that end, Workman has incorporated a "wash-station" (hose) and two drains at the aft end of the cockpit. Covered with classy, stainless steel screens, they drain into the bilge, where a 2000gph bilge pumps sends everything overboard. To provide maximum fish-fighting space, the cockpit's equipped with twin, moulded fibreglass, chilly bin seats (55 litres each). They have upholstered seats, and as free-standing units, they're easily moved to suit the boating mode (fishing, skiing or just cruising). They're particularly well-designed bins, featuring movable shelves inside to maximise storage. Then there's the battery of six rocket launchers on the trailing edge of the hard top, complemented by rod holders in the gunwales. More rods and fishing tackle can be carried in the upholstered, full-length pockets running either side of the cockpit. And to give yourself the best chance of a successful fishing trip, the boat is fitted with a Lowrance LCX 37C 8" combination GPS/fish finder. Works a treat, but if you're a little short-sighted, you could easily upgrade to a 12" model – the boat's centre console has enormous space for all manner of accessories/instruments. If the fishing's really good and you're tempted to stick around a little longer, you're in luck: the Aggressor's a good contender for overnighting. After fitting the clears, you retire to a fairly spacious cabin, with infill squabs creating a large double berth. The infills also cover the toilet mounted between the berths. The boat's equipped with separate start and house batteries, and to minimise the power drain at night, it uses high-efficiency LED lights. It's a well-designed layout. Everything's designed for easy access and minimum fuss. The Sony entertainment centre, for example, has a small remote mounted under the trailing edge of the hard-top. So, if a jarring music track is spoiling your concentration, just reach up to change it or adjust the volume. Similarly, the fully automatic Lewmar windlass is activated from the helm. That's just as well – the Aggressor doesn't have any side decks (the only access to the foredeck is via the cabin hatch). But the absence of side decks translates into a wider internal beam and bigger volume in the cabin. For me, it's the right trade-off. 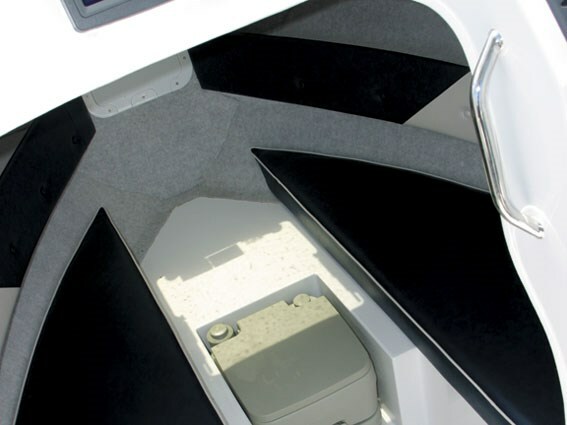 There is access to the anchor locker through a watertight hatch in the cabin's forward bulkhead. There's no excuse for being uncomfortable at the helm station. 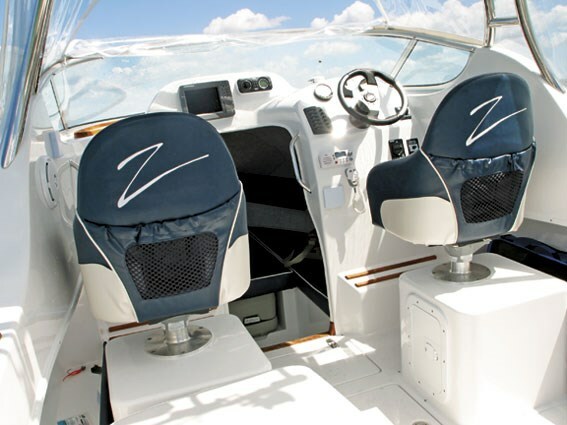 The boat's equipped with a plush, upholstered skipper's seat (and a matching co-pilot seat). Both have adjustable bolster bum cushions, and both seats can be swivelled-and-locked in 90o increments. They also have fore-and-aft adjustment, and are mounted on moulded pedestals containing large storage lockers. The hydraulic steering provides easy manoeuvring, and visibility through the large windscreen (and separate side windows) is excellent. Within easy reach are a bank of toggle switches, the windless button, a Uniden VHF and the Sony entertainment centre. While our review Aggressor was fitted with a 150hp ETEC (Wilson says Evinrude is Zenith's engine of choice), buyers can specify any outboard. The two-stroke's significant power-to-weight ratio no doubt contributes to the boat's performance (the Aggressor's all up dry weight on the trailer is around 1500kg). Our review took place on a very blustery day on the Hauraki Gulf, with an awkward chop of nearly a metre. These are never comfortable conditions for testing a boat's speed and general performance, but they offer a sense of its sea manners. Two impressions: the Aggressor responds beautifully to the torque pouring from the ETEC; and the fine entry and 26o dead rise offer a pretty smooth ride – even in those conditions. There was no shortage of spray, but the chines do a good job of keep it away from the boat. We couldn't measure the Aggressor's fuel consumption, but with its 160-litre underfloor stainless steel tank, the boat should have a comfortable range. It's just a matter of selecting the optimum cruise speed. A 1500kg dry weight makes the Aggressor a relatively easy boat to tow. It rides in a tandem axle Voyager trailer (with a choice between braked or unbraked) fitted with submersible lights. The Aggressor is a handsome package – speedy and agile with a quality finish. As with any boat, the key to superior performance is a good hull – one that neatly balances hydrodynamics with strength – and presents it all with style.